Wiiliam P. Hobby Airport Parking Your car can pay for your parking space. Wiiliam P. Hobby Airport Parking : Airport parking is a common challenge experienced all over the world. It is undoubtedly the most unpredictable and hectic activity at the airports. Travelers and airport visitors often worry about the safety of their vehicles, finding a suitable parking spot near the airport terminals, and the cost of parking. All these worries nag on a traveler’s mind to the point of arriving late at the security checkpoints and consequentially missing flights. There is a perfect solution for all these problems, TravelCar’s affordable parking deals. TravelCar has the cheapest parking deals in the whole of United States of America. We are present in the State of Texas, that is, at the airports, train stations, downtowns, and seaports. We have a ride-sharing service that resonates well with your long-term parking needs and car rentals for travelers in need of a vehicle in a new town. We have a clear cut-out booking procedure. All bookings must be made online at www.travelcar.com. 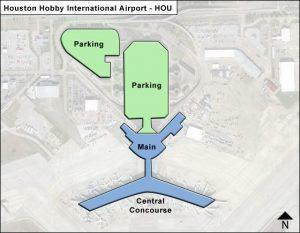 William P. Hobby Airport is an international airport that was constructed in the year 1927. The airport is situated on the South-East direction of Houston Downtown. It is about 11 miles from Houston City. The airport is a focus city for Southwest Airlines that contributes greatly to international flights at the airport. In 2017, the airport recorded passenger traffic of 13,283,565 passengers. 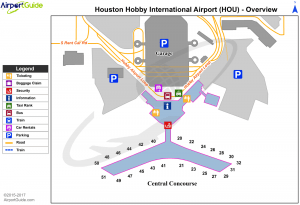 Built on 1,304 acres of land, HOU boasts of four runways, one terminal with 25 gates, and one Central Concourse. The concourse hosts several eating joints, a chapel, and the 1940 Air Terminal Museum. William P. Hobby Airport 34th busiest airport in the USA. William P. Hobby Airport is surrounded by other notable airports such as George Bush Intercontinental Airport, San Antonio International Airport, Austin-Bergstrom International Airport, and Corpus Christi International Airport. Several big cities are neighboring William P. Hobby Airport. The table below shows the nearby cities and their respective distances from the airport. TravelCar has low-cost parking lots offsite. Not only are the parking lots easily accessible but also safe to leave your car and attend to other duties. Our parking arrangements are the most affordable in the Houston area. The parking prices are even friendly when you book in advance. You stand to get discounts on current rates. If you are a repeat user of TravelCar services, you are liable for awesome deals in parking prices. The parking premises are covered to shield your vehicle from excessive sunshine. We offer car maintenance services like interior car detailing, car wash, exterior car detailing, wheel alignment, wheel changing, oil changing, checking and optimizing tire pressure, and car buffing. On matters regarding the security of your automobile, we are situated offsite, hence less risk of your car being bumped on by another vehicle. Additionally, we have both human and technical surveillance. For the human surveillance, we have security guards standby at all times to monitor movement in and around the parking area. For the technical surveillance, we have CCTV cameras installed at strategic points in the premises to track and capture videos of all activities at the parking premises. Securing your parking space is simple, log in to www.travelcar.com and subscribe to parking space. Select your plan, whether short-term or long-term parking. Get a quote for the same and book! Our customer service channels are open 24/7 to answer your queries and guide you through the booking process. The major train stations near William P Hobby Airport include UH South/ University Oaks Station, Magnolia Park TC EB Station, and Palm Center Transit CTR SB Station. Other significant train stations are Altic/Howard Hughes Station, Magnolia Park TC WB, Elgin/Third Ward Station, Cesar Chavez/67th Street Station, MacGregor Park/ Martin Luther King, Jr. Station, Robertson Stadium/UH/TSU Station, and Cesar Chavez/67th St EB Station. Get sumptuous meals and enough rest before or after your flight at these reputable hotels: Hilton Houston Hobby Airport, Country Inn & Suites Houston Hobby Airport, Rodeway Inn Hobby Airport, La Quinta Inn & Suites Houston Hobby, Hampton Inn Houston Hobby Airport, Americas Best Value Inn Houston Hobby Airport, and Comfort Suites Hobby Airport. Other hotels worth checking out are Motel 6 Houston Hobby Airport, Executive Inn & Suites Houston, Days Inn & Suites Hobby Airport, Marriott Houston Hobby Airport, and Drury Inn & Suites Houston Hobby. At TravelCar, it is all about making the life of a traveler easier and comfortable with a touch of class on top of it. Our offsite parking lots are away from crowdy and maniac-like parking lots seen on the airport grounds. Let’s face it, finding a super spot at the airport can be daunting and very expensive. That is why we have a safe zone for you to leave your car, no bumping on to other motorists. We offer unbelievable discounts on prices for individuals who make early bookings on our website at www.travelcar.com. We have services like wheel alignment, car vacuuming, high-pressure car wash, interior and exterior car detailing, checking oil levels and checking brakes. If you are using an electric vehicle, it is charged at our charging stations. TravelCar has a ride-sharing service that allows visitors and travelers to use cars left behind for extended periods. The vehicles are usually listed for rentals in the period the owner is away. This is typically possible when a car owner agrees to the plan instead of paying for long-term parking, he or she gets reimbursed for the mileage the vehicle has covered while he or she has been away. All sides benefit in that there is minimal pollution of the environment from gas emissions and there is less congestion on the roads leading to the airport. Another key benefit for travelers is that they do not have to get someone to take the car back home, it stays in our parking lots, gets serviced and rented out when the need arises. Your peace of mind is granted. For the person renting out your car, he or she benefits from getting a vehicle that suits the occasion. It could also be functional depending on the terrain of the area to be visited. Most often time, we select a brand that is popular and trusted. A brand that is highly vouched for is ten times more likely to deliver quality service than one that is not. TravelCar is a reliable brand highly attested to by Trustpilot. With a score of over 9.0, TravelCar has risen in popularity over the years due to impeccable customer service and high-quality transport services. Travel with TravelCar, the known and trusted brand. We have 24-hour valet service team on standby for clients who need the assistance. Valet service is affordable and readily available. Prior booking of valet service eliminates unwanted rush at the parking lots. TravelCar has a whole team of professionals with excellent interpersonal and communication skills. They understand and value your need to hasten the checking in process. In that regard, you leave the parking to them, and they will do an excellent job. Furthermore, if you have any luggage with you, they will be more than happy to assist. Prior communication is what makes the whole business of traveling more efficient than rushed travel. A good traveling plan encompasses how one will get to the airport, which airline to use and which means of transport to use from the airport. Additionally, one may need to consider a place to stay, be it a hotel room or a Bed & Breakfast property. Tourists need to have a rough idea of where to shop and the most exciting places to visit. Therefore, proper planning is vital, and TravelCar encourages travelers to book early for services. You can choose to book a parking space, valet service or a car rental. You not only get to reserve your space but also save a few coins from the breathtaking and affordable parking deals we have for you. If all these make sense to you, then hit us up on our website at www.travelcar.com or call us on the number +1 888-807-0209. You may also chat with any of our agents on Twitter, Facebook, LinkedIn and Google +. Our social media links are Facebook- https://www.facebook.com/TravelerCar/, Twitter- @Travelcar_, LinkedIn- https://www.linkedin.com/company/travelcar/, and Google+- https://plus.google.com/+Travelercar. West Telephone Road, Interstate-610 Eastbound, Exit 33, Interstate-45 Southbound, Exit 39, Broadway Street. Interstate-45 is usually super busy during the peak hours of travel in the city. You are therefore advised to leave for William P. Hobby early to beat the traffic and avoid missing your flight.